Unlike its breathtaking scenery, Swiss food sadly doesn’t always receive gasps of admiration and a slew of superlatives. In fact, it is often misrepresented as being bland, boring and unimaginative. Although well known in Europe, the country’s culinary gems rarely get feted outside its borders, so I’m on a Tour de Suisse to debunk the myth that this cuisine primarily comprises of cheese, milk and platters of cold meat. Whilst planning my gastronomic adventure, a trusted foodie informant suggests a pit stop in Ticino — the southernmost canton in Switzerland — in lieu of the usual bigger cities, because of its regional specialties. 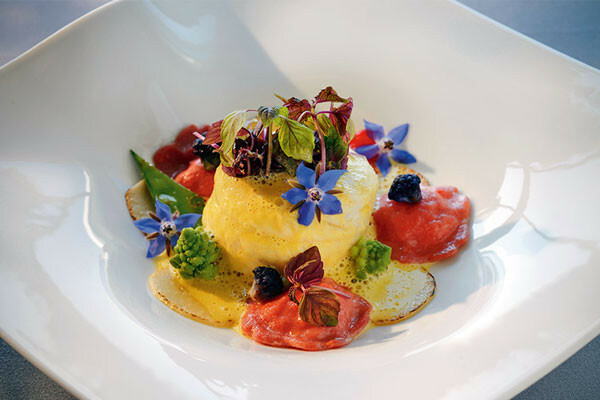 Popularly referred to as Switzerland’s ‘sun parlour’, greeting guests with an Italian flavour and Mediterranean flair — Ticino’s cuisine is a cross-pollination of North European and Italian cuisines (particularly in Lombardy), culminating in a marriage of the choicest pastas and salamis with farm-fresh Swiss produce. 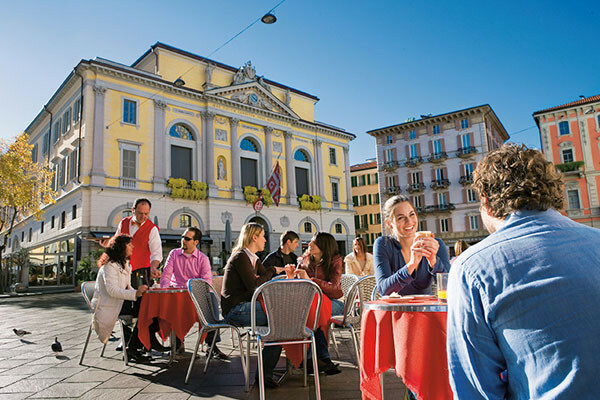 The epicentre of life in the city, this public square is buzzing with food stalls and has been described as ‘the dining room of Lugano’. This is street food at its best. 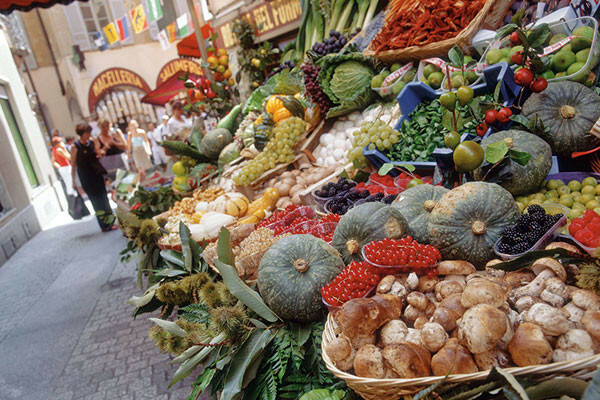 Wander around the markets where local delicacies are served up piping hot, including chard parcels (Swiss chard consists of spinach-like leaves filled with air-dried beef cooked with parsley and white sauce) and every conceivable form of salami and meat, Alpine cheeses and much more. All this in a cheerful and carefree setting as traders and locals jostle for space, wolfing down morsels of regional delicacies. Try the marrons glacés (candied chestnuts) that are served by vendors. Meat eaters must dig into bollito misto, a hearty beef stew. The Grand Café Al Porto is as synonymous to Lugano as the lake. European grandeur and pomp still rule the roost in the elegant oak-panelled cafe, established in 1803. This historical restaurant gradually became Lugano’s Salon, attracting politicians, scholars, artists and other notables. Ladies lunch and high-powered ministers of state feast on duck liver pralines and spaccatelle pasta with wild boar ragout; typical Ticino cuisine seasoned with a generous pinch of southern flair under the stunning art nouveau stained-glass ceiling of the restaurant. Being a slave to sausages, I hanker for the Luganighe (a Ticinese raw sausage containing pork and spices) before calling it quits, only to be enticed by a local desert called ofetori, made of apples stuffed with polenta and sugar. Via Pessina 3, 6900 Lugano. Locals love dining in grottos or small, rustic-style inns that originated as cool excavated cellars. Just a 15-minute drive outside Lugano, one is transported to a world of scents and flavours rooted in homestyle cooking — cured pork products like salami and mortadella, polenta-stewed rabbit, busecca or tripe soup, marinated fish, veal tonne, roast beef, polenta with braised meat, cazzöla (a hearty meat casserole), zabaglione, bread cake and wine flavoured peaches. Via Municipio 8, 6927 Collina d’Oro. On my last day in Lugano, I dine in the city’s only Michelin-starred restaurant located inside an art gallery. Situated on the lake, the restaurant-gallery offers stunning views of Lugano as well as international artworks. Head chef, Frank Oerthle, creates spectacular signature dishes in a menu that specialises in lake fish and seafood. C/O Grand Hotel Villa Castagnola, Piazza Emilio Bossi 7, 6906 Lugano. Next stop, the achingly-fashionable ski capital of the world — St. Moritz. The cradle of Alpine skiing is also the birthplace of winter tourism. Here, it’s not uncommon to bump into Hollywood stars and royalty. The food is grand and suggestive of the region. This venerable institution, with its graffito facade (restored in 1985), is synonymous with St. Moritz. The confectionery has been serving queues of eager locals and tourists since 1894, when Fritz Hanselmann opened his own bakery. 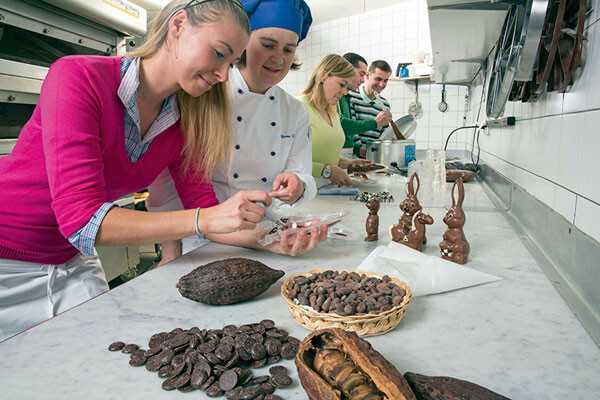 Indulge your sweet tooth with specialties such as Engadine nut cake, marrons glacés and their signature hot chocolate. Via Maistra 8, 7500 St. Moritz. At the five-star Kempinski Grand Hotel des Bains, we sample the specialty of the region — a wedding soup made of barley. This dish has such a long tradition that no wedding here would be complete without it. The ingredients are poured into a flan case and baked to perfection under the skilful eye of Chef Axel Rutling. Engadine beef Angus steak is a must-try, accompanied by a wholesome veggie pie with a pastry base of leeks, potatoes and apples. Finish with an Engadine nut tart – rich, flavoursome and stylish, just like St. Moritz itself! Via Mezdi 27, Kempinski Grand Hotel des Bains, 7500 St. Moritz. A fascinating experience awaits meat lovers. Ludwig Hatecke produces amazing dried meat delights, including deer and chamois. Besides the salsiz (sausage) and bündnerfleisch (air-dried beef), his shops also stock the wine to go with them. Hatecke uses only premium meats from the region, all seasoned with caution. Via Maistra 6, 7500 St. Moritz.